It’s a rare thing to encounter a person who has devoted themselves wholly to making others feel better, live better and be happy. As a medical professional, as a book reviewer, as an author and as a mother, Christine Morgan has dedicated herself to making others happy. 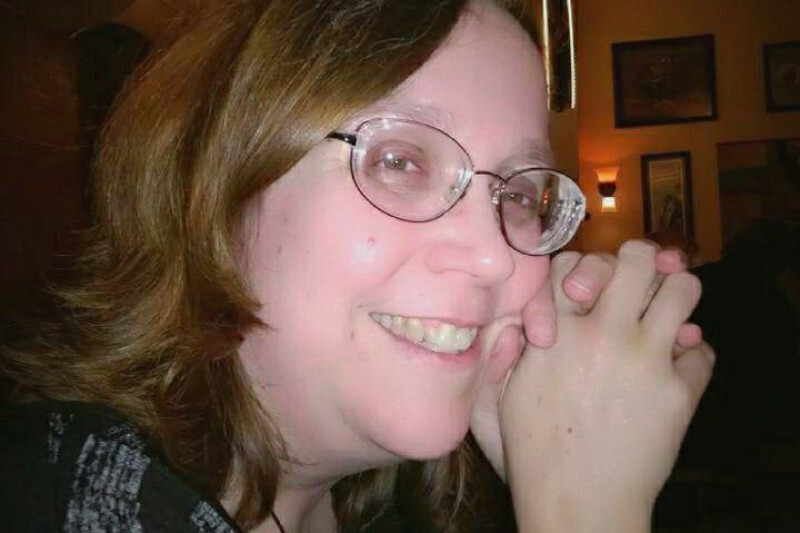 Her friends and family know her as a warm and positive person, and she is always willing - in some cases, eager - to bake delicious treats, craft dolls based on genre horror or other authors' characters, and provide unflagging support for small press publishers and the Portland Bizarro scene. 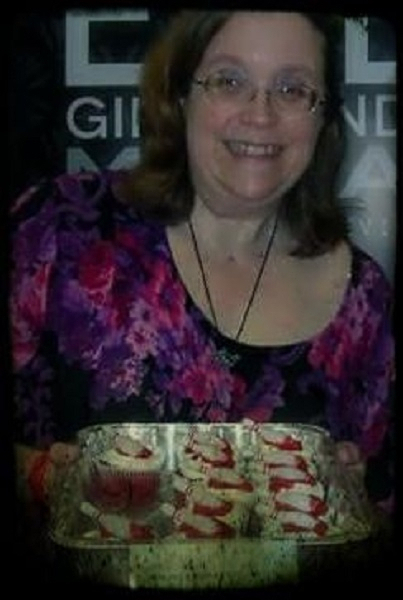 Christine with Murder Girl cupcakes she made for her epomymous book release. Sadly, Christine is faced with terrible challenges lately. After beating thyroid cancer while in college, last year she was diagnosed with it again. Christine suffers from cancer of the nose and mouth and has received numerous surgeries and treatments. While Christine remains confident and tenacious, she is about to go through another round of surgeries and hospitalization, and because she cannot work while dealing with these issues, the financial devastation is every bit as harsh as the physical. While the cost of her treatments are staggering, this does not mean that donations -- no matter how small -- can’t help to make Christine’s life better. From day-to-day expenses, unforeseen emergencies, and her medication regimen, these donations mean that she doesn't have to choose between eating, purchasing medication, or providing food and pet care for her cats. For people facing serious health issues, the financial and emotional impact of these expenditures cannot be underestimated. Christine gives so much to her friends, her family, those she works with, and her support of the arts in general, and this is our chance to give back. A win-win way to support Christine without donating directly is to buy one of her books! Peruse her titles at her Amazon page. Christine here! 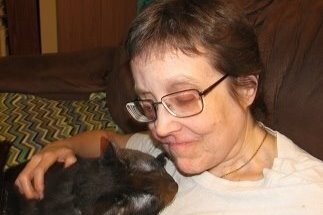 It’s been over a year since this GoFundMe was first posted, and I want to once again thank everyone for their support! The messages and words of encouragement as I’ve struggled along this journey have helped a great deal. And, of course, so have the donations! I’d be even deeper in debt without your generosity. I am, however, still pretty deep in debt. This past year has brought me a few more hospital visits, some due to trying to figure out a critically low blood pressure issue caused by what turns out to be an adrenal insufficiency (now on medication for that and doing MUCH better! ), as well as the ongoing efforts to put my face and mouth back together after the initial cancer surgery. They tried twice to replace the roof of my mouth with tissue grafts harvested from other parts of my body (once lower leg, once lower arm, leaving some damn impressive scars on both), but neither ultimately ‘took.’ The next option was being fitted with a dental prosthetic ‘obdurator,’ which blocks the hole and gives me false teeth on the upper front and right. But, thanks to the way insurance does stuff, the prosthetic itself wasn’t covered. Considered dentures or cosmetic or something, instead of medically necessary. Given that they’d CUT A GIANT HOLE through the roof of my mouth and taken out a third of my TEETH, given that I couldn’t eat, drink, or take meds without things washing up into my nose … given that I couldn’t talk worth a damn … personally I felt it was pretty necessary, but even my advocates’ best efforts couldn’t sway the insurance company. As a result, the prosthetic cost me over eight thousand dollars out of pocket and is now, with the possible exception of my car, the most expensive damn thing I own. But, I can finally TALK again; maybe not great yet but far from the total slurred mushmouth I was. I even gave my first public reading at a convention in January. Makes working much easier, too; it’s a good thing my job was night shift anyway and didn’t require a whole lot of conversation or phones (been back to work since February 2018, btw; had to go back ready or not because benefits were running out and they were about to cut me loose). There’ve been some subsequent surgeries and procedures since then, because my face didn’t react well to the metal bar they used to rebuild part of my cheekbone. 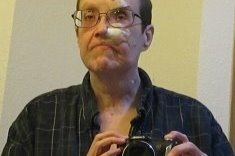 Doc says it’s partly due to the radiation treatments; my irradiated facemeats and fragile skin don’t heal as well, and did not want to heal over the metal. As a result, I had more holes in my face, exposing the metal bar and part of my facebones, for several months. To attempt to correct THAT, they brought a patch of tissue from my scalp down to cover the holes, which was its own months-long ordeal of weirdness and grossness and pain, with a fleshy umbilicus thing down half my face and staples and stitches and yeah let’s just not even go there; I wasn’t quite masked like the Phantom of the Opera but I certainly could have been. Even these procedures ran into problems with healing, leading to a few follow-ups. The most recent one, as of March 2019, removed most of the metal and seems finally to be taking okay (as a bonus, though, the transplanted scalp bit means, since my hair growth has at least recovered well, some of it now grows from there, which is inconvenient and funny-looking but in the scheme of things not such a big deal). What I refer to as my ‘frankenface’ is still kind of a mess. The docs tell me it’ll continue to get better, but I will always have the scars and definite irregularities where they’ve patchworked me back together. Luckily, my looks were never my strong point anyway. As of this writing (April 2019), I’m in a holding pattern to see what happens next. Barring any troubling developments, I don’t have to see the docs again until July for a check-up, and the dental prosthetic is fitting well with no current need of further adjustments. It’s been almost two years of having to schedule everything around appointments, so suddenly not having any looming is almost a shock. Not sure what to do with myself, without all that on my calendar! Other changes through all this have included a fairly drastic weight-loss, this due to a combination of side effects from the radiation (weeks of burns and blisters inside the mouth) and dehydration and simply not being able to eat … effective as it may be (I lost 80 lbs), I really don’t recommend it as a strategy. So, here we are now. As can be seen from the pics, especially comparing the ones originally posted for this fundraiser with the latest additions, I hardly look the same at all. A lot damn older and haggard, more like my own grandmother than I ever realized. But, my hair’s grown back, and I can talk, and am not passing out or in constant pain. I’ve been able to write again, resumed many normal activities such as baking and crafts and participating in the local literary scene, even managed to go to (and dance at!) my sister’s wedding! I could still use some help, though; not too proud to admit it. My job doesn’t pay the big bucks, and while the writing brings in some extra (just being able to say that is humbling and a shock in itself! ), the bills are still coming in and it feels like an ongoing slow downward doom-spiral, and a scramble to keep afloat. The most recent bill brings me to about $16k in debt. Ideally, I’d love to be able to land a sweet book/movie deal and cover that and then some; hey, we can dream! But, in the meantime, I’d welcome any further donations and contributions. I can write stories for people, make crafts, bake cookies, do edits, stuff like that to show my thanks. This has all been very rough. I’ve shared a lot of the gory details on Facebook, partly because it helps me feel better to do so, and partly because I’ve heard from others it helps them when dealing with their own troubles. People have told me they admire my strength and perseverance and humor through all this. I’m glad for that. I don’t know if I see it as strength myself … perseverance, yes, because I don’t have much choice … and humor because given the choice between laugh or cry, I’d rather laugh. But yes, it’s been rough. I have my low points and bad days. Somehow, I hold on and keep going. If I can get through this, if my experiences help someone else get through their own, it’s all good. And hey, it’s also all research, right? If you’ve read this far, thank you again, so very much! (though maybe you need a new hobby? I ramble like whoa). If you can toss a few bucks my way, or share the link, or lend a hand to another friend in need, thank you even more! "Checking into the hospital at 6:00 a.m. Wednesday for next round of surgery, to remove the exposed/infected metallic plate in my face (but they may let me keep it as a souvenir). They’ll make a similar incision as last time, splitting my upper lip, around the nostril, up the side of the nose. Then stitch it all back up again when they’ve taken the plate out. While they’re at it, they’ll patch the hole in the roof of my mouth, which will not only help prevent food and liquid from going up into my nose (ick) but should improve my speech. To do the patching will mean harvesting some tissue, skin, and blood vessels from my left arm, but not bone, so it shouldn’t be as bad as what they did to my leg. Will likely need to wear a brace for a week or so, may slow down my typing. Anticipating at least 3 days in the hospital, probably back on a feeding tube for some of it but hopefully not another tracheotomy. Of big concern is the ongoing blood pressure / adrenal insufficiency; they may give me a “stress dose” of steroids beforehand and will do close monitoring." We're here for you Christine! You are strong and a badass! Thank you everyone!! Christine is staggered by your generosity and we're going to keep this campaign going . Everything helps. Me, I'm a bit gob-smacked. Thanks for showing your kindness and love. If you donate $100, Christine will write a 250 word story for you! For $250 Christine will craft a personalized nut doll (5-8" in length) for you! For $1000, you will be a character in Christine's next novel. RAD.